This is a miso soup made of fresh shrimp ground to a paste, mixed with flavoring ingredients, then whisked into hot dashi stock until just cooked. It's called ebi no nagashi jiru (ebi is shrimp). It's a quite traditional soup that used to be laborious to make, before the advent of the food processor. It's not one that is served that often in homes, perhaps because it used to be a bother to make, or perhaps because miso soup is rarely the star of a meal. It's really delicious in any case, and shows yet another way of making a miso based soup. Nagashi jiru is traditionally made with fresh bonito (katsuo), but bonito is probably not that easy to get a hold of, so I have made it with shrimp here. It can also be made with fresh tuna or a white fish like red snapper. Fresh ginger and sake are used a lot in Japanese cooking with fish or meat. These ingredients, plus onion, help to lessen any gamyness (kusami). This technique is also used in Chinese cooking. Here ginger juice and sake are used to make the shrimp taste brighter. The soup has a coral color from the shrimp, and an intriguing texture. Make the dashi stock following the directions on day 1. Chop the shrimp up roughly and put in the bowl of the food processor. Process until finely chopped. Add the miso, ginger juice and sake, and about 4 to 5 tablespoons of the dashi stock until it is a very smooth paste. Serve with a sprinkle of green onion. Variation: add some cubed tofu. Submitted by maki on 2006-09-02 00:17. I cooked a variant of this last night, with chicken stock instead of dashi (through I do have a good eastern wholesaler near my work, so I'll try and get some for next time) and spring onion instead of green onion (are they the same?). I can see why it would be a lot of effort without a blender! Got to say as this is only the second Japanese-esque meal I've made, it was awesome by the way, I'm really enjoying the exercise as a whole and this site, I look forward to trying and enjoying more great recipes soon. 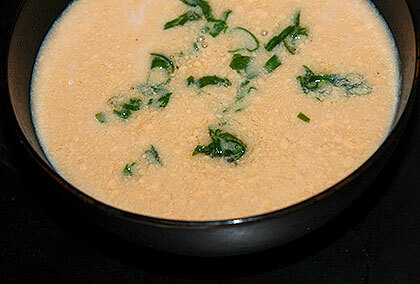 I have tried the first couple of miso soup recipes and I have to say I am looking forward to trying this one as well. The results are so beautiful for such simple efforts. I make a half recipe and it is enough for my husband and I for breakfast. It has been a godsend for us as we are both sick with the flu and really need the soup. Thanks Maki for your great blog. I am learning so much from it! Can we have an alternative for the red snapper? what changes should there be? I made this and it turned out bizarre, with the shrimp paste "curdling" and floating on top when I added it to the hot dashi. Taste was fine, but next time I'll puree the shrimp, whisk it into the cold dashi, then bring to a simmer while continuing to whisk.